Hi everybody, and welcome to a new edition of Something Different Sunday! Today I’d like to talk a bit about music! As you may already know, music has always been an important part of my life. I’m someone who forms big emotional connections to certain songs and as such, music plays a really big part in keeping me motivated. It’s also something that always manages to get me through tough times. So I figured, why not talk about some of those songs? For me, sharing these songs is a way of opening up and sharing my thoughts and feelings with you, without getting too personal and whiny, but on the other hand, perhaps these songs can help someone else as well! I figure this will be a recurring topic, so I’d like to start with songs I relate to a very specific time period, namely my personal experience with the first half of 2017. As you may or may not know, 2017 has been a pretty tough year for me. In December 2016 I lost my job of 10 years and I struggled with this fact for months. It hit me way worse than I let on, or even more than anybody ever knew or understood. In the meantime I’ve been happy enough to have found a new job, but those dark months still brought on so much hurt, self-doubt and loneliness that will stay with me for a while to come. On top of that, there is of course the general dumpster fire that has been our reality in 2017 and I’ve ended up needing to rely on music A LOT. So shoutout to all the songs below for having kept me going! Voldemort is a song talking about mental illness. Just like with Voldemort, people don’t like talking about it out of fear and stigma, but ‘fear of a name only increases fear of the thing itself’ and even if you don’t talk about it, it’s still a looming presence in a person’s life. I like the message of this song and just the hope I feel when I listen to it. If the past months had a soundtrack for me, this would be the title track. It’s the song that introduced me to kpop, but also I just adore the general message it sends. I’m pretty new to One Ok Rock, but their album called ‘Ambitions’ has been on repeat for months. I love it so much, but Start Again is probably my favorite song of the album, because of the themes of being yourself, always and unapologetically. And well, starting again. As It Is is one of those bands that know just how to mix upbeat sounding songs with emotionally gut-wrenching lyrics, which speaks to me on so many levels. I love the lyrics, which talk about how tough it can be to open up to someone else when you’re just not feeling okay, and the pressure of always showing your best self to others. Sometimes you just want to be able to say ‘No, I’m NOT okay.’ I also just really love this acoustic version. Another song I put on repeat so, so many times this year. Though about a broken relationship, I especially related to the theme of needing to move on, but not being quite ready to do so yet, and just waiting for that green light. Plus the song is just so catchy and danceable! Sometimes you just need an angry song to get you through the day, and that is where this jem comes in. It’s a bit older, but I just discovered it this year and fell in love. As I may have a mentioned a few (bazillion) times already, I really got addicted to kpop this year. I never would have expected to, but I did and I just owe so much to kpop. BTS is one of the bands in particular who really helped me keep going, and especially this motivational anthem has been helpful in getting me out of bed many mornings. My 2000’s rock loving self was so pumped when Papa Roach released a new album this year and I LOVED every single track on it. Born For Greatness is one of those songs that keep me pumped and motivated and ready to carpe the hell out of this diem. Oh hey, it’s BTS again! Sorry about that, but I just couldn’t NOT mention Spring Day. It’s a little less motivational and a little more confrontational for me, but if there is one song that perfectly describes my feelings the past few months, and my loneliness in particular, it’s this one. It’ll forever be a favorite. Why did I sleep on the awesomeness of Little Mix for so long? Sometimes a girl just needs some poppy girl power in her life! 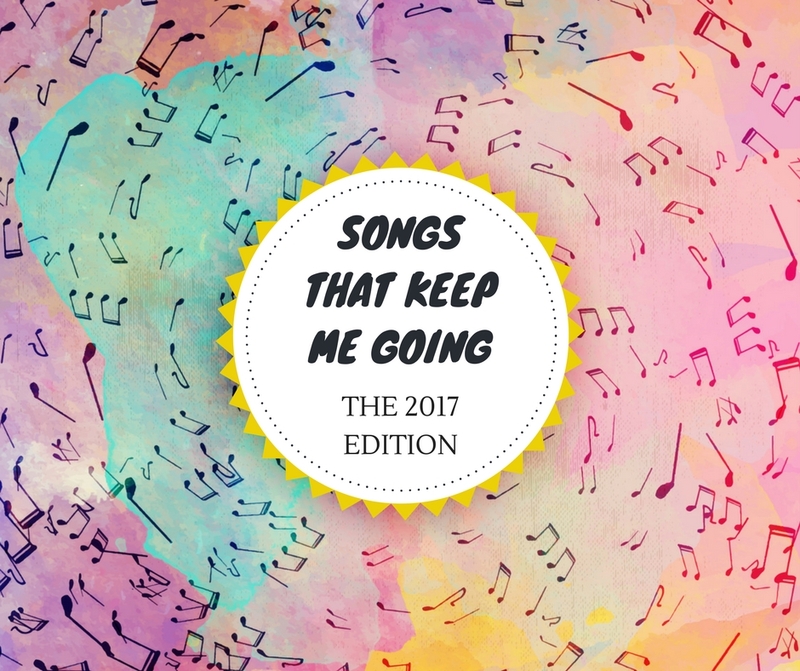 So those are the songs that got me through the first half of 2017! What are some songs that keep you going? What’s your number one favorite song of the moment? Ahhhhhh I love this SO MUCH. You have such a great taste in music 😍😍😍 I love Voldemort so much! It’s such an amazing song and as soon as I learned about the meaning I loved it even more. I actually met With Con last year and got to tell them how much the song meant to me and it was such a great feeling ♥ I also LOVELOVELOVE Bite My Tongue. Fallout, Okay, Salute and Green Light are so great too. Also, if it’s okay I might do a post like this for a future Music Monday?? I’m SO with you. Music is my therapy as well. Even if it is just a snippet of a song it can help. Sometimes you just need to dive into your feelings and music seems to be there. Loved all the samples. Thanks for sharing. I also listen to a lot of country music, Penatonix, Rachel Platten, Dan + Shay, Katharine McPhee, Alexander Jean, and have loved discovering cover artists on iTunes. So many talented artists. Music is a fabulous way to help inspire something (like writing – I always listen to music when I write during my night owl sessions). Marianas Trench and You Me At Six are both such amazing bands indeed, glad to hear you love them as well 🙂 Hope you’ll find something else to enjoy from these as well! Love this! I’m a big music fan and different songs and artists really do help me through tough times. Thanks for sharing all of these. I had no clue there was a song called Voldemort; I need to listen to this one!! These are all new songs to me! (Although in my defense, I am shockingly behind on albums and new releases, etc…..I just find a song that I like, listen to it, and don’t really worry about how old it is, what the public’s response to it is, and even sometimes who the artist is. I just enjoy it, hehe). You have really great taste in music. The Lorde song was the only one I’ve listened to before, but I’m loving all the rest of them!